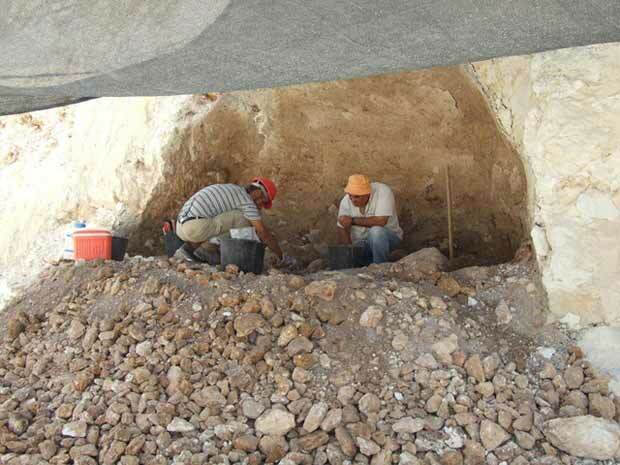 In July 2008, an excavation was conducted south of Nofit (Permit No. A-5465; map ref. 21412-20/73879-900; Fig. 1), after antiquities were damaged during road construction. The excavation, undertaken on behalf of the Israel Antiquities Authority and financed by the Israel Lands Administration, was directed by D. Syon (field photography and numismatics), with the assistance of Y. Ya‘aqobi (administration), A. Shapiro (GPS), R. Mishayev (surveying), E. Belashov (plans), L. Porat (pottery restoration), H. Tahan-Rosen (pottery and glass drawing), L. Kupershmidt (metallurgical laboratory), Y. Gorin-Rosen (glass), D. Avshalom-Gorni and N. Getzov (pottery reading) and laborers from Yafia. Horbat Qoshet is a small ruin that was not excavated previously. In 1969, fragments of a menorah relief engraved on a marble slab were found at the site, which, based on the shape and style of the menorah, was dated to the fifth–sixth centuries CE (Foerster 1974:77–79). 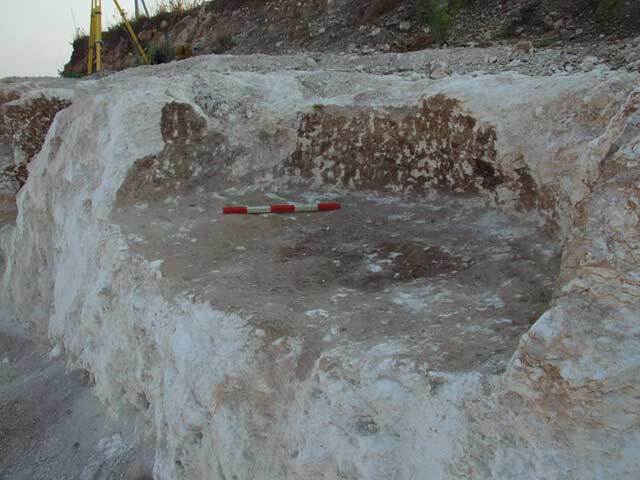 In an archaeological survey of the site following the publication of the relief, a large structure was measured that was identified as a public building, possibly a synagogue (Raban 2012: Site 35). Burial caves were found south of the ruin. The finds mainly consisted of pottery dating to all phases of the Roman and Byzantine periods and a lesser number of sherds from the Iron Age and the Persian, Hellenistic and Islamic periods. Near ​​the site are many remains of ancient settlements that can be defined as Jewish based on surveys and excavations; most of the artifacts from these sites are from the Roman period. 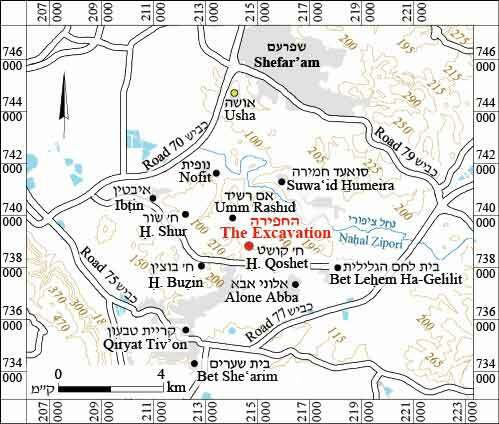 The area is located within the territory of Jewish Galilee that was centered around Usha and Shefar‘am in Mishnaic times (Fig. 1), where the names of many settlements were mentioned. A number of them have been identified with certainty: at Horbat Shur (Olami and Gal 2011: Site 123), ‘Sikhin’-type pottery vessels characteristic of Jewish settlement in the Roman period were gathered; at Khirbat Umm er-Rashid (Raban 2012: Site 29), column fragments and numerous ashlars were identified that may be the remains of a synagogue; at Horbat Buzin (Raban 2012: Site 23), an engraving of a seven-branched candelabrum was discerned, on the opening of a burial cave. In the northern cemetery of Bet Lehem of Galilee, a burial cave with loculi was surveyed (Raban 2012: Site 52, Fig. 2), characteristic of Jewish settlement in the Hellenistic and Early Roman periods. A church was discovered within the settlement itself, indicating that it was inhabited by Christians during the Byzantine period (Oshri 1998). 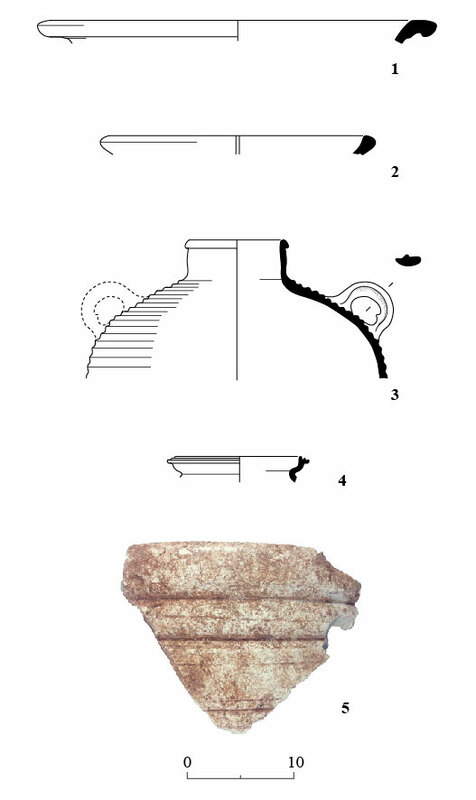 A pottery assemblage that included Herodian lamps was found in Alone Abba, attesting to a Jewish settlement there in the Roman period (Porat, Frankel and Getzov 2012, particularly p. 67). Burial caves that included ossuaries dating to the second century CE were excavated in Tiv‘on (Feig 1996; Beck 2000; Vitto 2011), and a plundered loculus cave was identified in Ibtin (Permit No. A-6178; Gendelman and ‘Ad, pers. comm.). A ritual bath (miqwe) was discovered at Suwa‘id Humeira as well as Herodian lamps and fragments of a stone kalal-type vessel (Syon 2011). That settlement apparently existed until the Middle Roman period (second–third centuries CE). Bet She‘arim, which is relatively close, was mentioned by Josephus as part of Jewish Galilee in his day. Bulldozers damaged the western side of the hill where Horbat Qoshet is located, and installations at the edge of the site were destroyed. 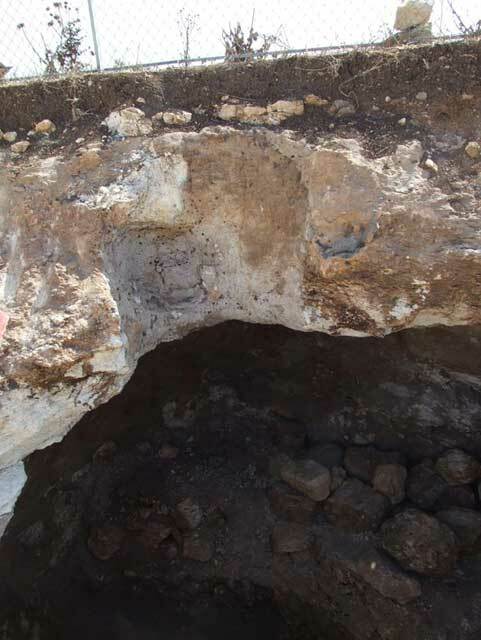 Five rock-hewn installations were partially damaged—three chalk quarries (A–C) and two water cisterns (D, F)—in which the excavation was concentrated (Figs. 2, 3). 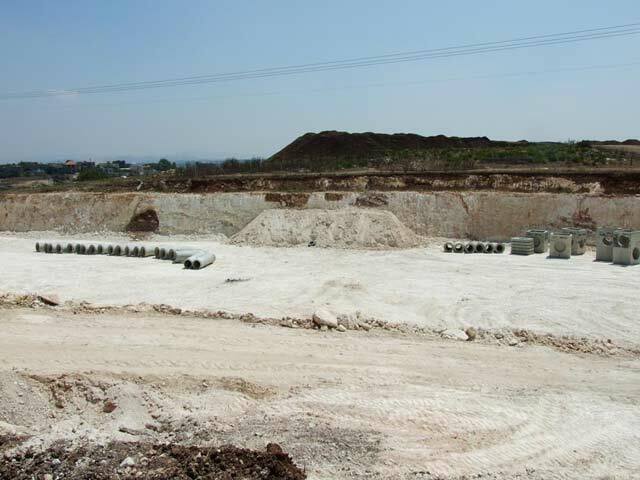 Chalk Quarries (A–C; Figs. 2, 4). 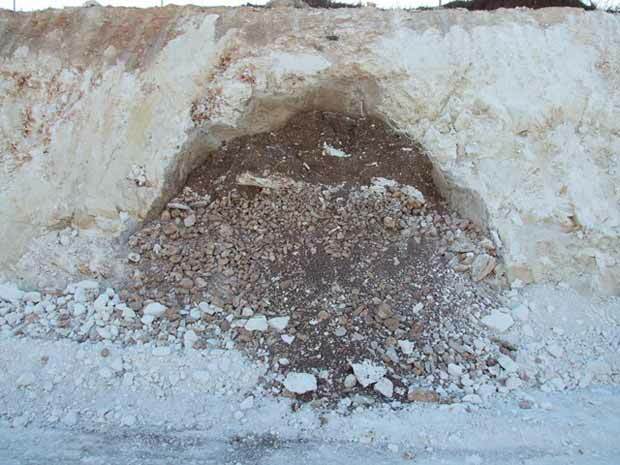 The upper part of the chalk quarries, which were also used in lime production, was removed in preparation of paving the road, and they were also severed lengthwise. Quarry A was round with sloping walls and may have originally been bell-shaped. It was found mostly blocked with nari building stones; pottery sherds and fragments of limestone vessels were collected in the quarry (below). A small rock-cutting connected to its northern part may have been another quarry. Quarry B was round and it too seems to have been bell-shaped. It was found filled with soil and practically devoid of pottery sherds. Quarry C was square and was not as meticulously hewn as were Quarries A and B. It too was found filled with earth, devoid of potsherds. Water Cisterns (D, F). Bell-shaped Cistern D was hewn in chalk bedrock and plastered; the quarrying activity severed it lengthwise (Figs. 5, 6) and its opening did not survive. The stratigraphy inside the cistern could be discerned in the section (described from bottom to top, partly visible in Fig. 5): clay, representing the time when the cistern was used (L107), in which four coins dating to the second half of the fourth century CE (IAA 106990–106993) were found, as well as a few pottery vessels and a fragment of a kalal basin; several building stones and pottery vessels in alluvium (L106) and a few skeletons of animals that apparently fell into the cistern during its use or immediately thereafter (Fig. 7); a layer of small, fist-sized stones (L105; Fig. 8) that extended across the full width of the cistern, c. 3 m below its presumed opening that was apparently placed there intentionally for an unknown reason, at an unknown time, possibly for planting fruit trees (Getzov 2004); a layer that consisted of chunks of chalk that had collapsed from the ceiling of the cistern, several pottery sherds and many animal bones; and a top layer of clean silt (L104). The pottery vessels and the coins indicate that the cistern was used for the last time in the Byzantine period. It may have been hewn earlier, but the recurring cleaning of the installation removed any evidence of an earlier period. The nature of its stratigraphy, particularly the animal bones, show that the cistern was abandoned and filled up with alluvium and debris over the course of a long time. Cistern F was also hewn in chalk and was almost entirely preserved. Unlike most cisterns, which are usually bell-shaped, this one was cylindrical and was coated with inferior-quality plaster. The rock-cut wall of the cistern shows that its opening was hewn in the hard layer of nari and was covered with earth and therefore it was not visible prior to the quarrying of the road (Fig. 9). 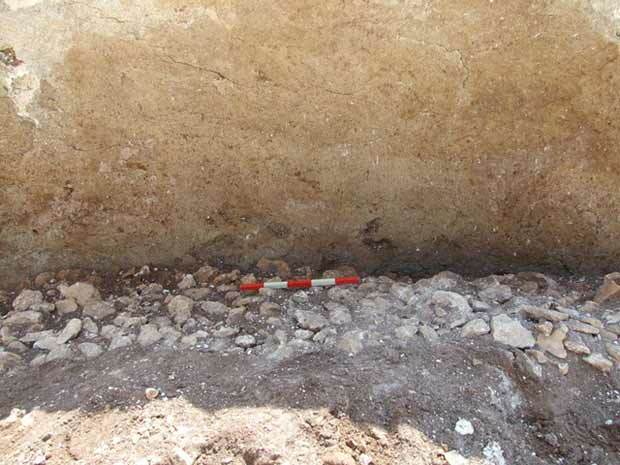 A layer of clay (L108, L110; thickness c. 0.5 m) on the floor of the cistern was found to be completely sterile around the perimeter; in the center was a very large concentration of about 50 intact and whole pottery vessels (Figs. 10, 11). Some of the vessels were jars, jugs and juglets intended for drawing water, but numerous kraters and cooking pots, still bearing traces of soot from cooking were also found, as well as several bowls and fragments of two lamps. Some of the vessels were found crushed on top of each other, on the clay and inside it, and it seems that they had slipped from the hands of the water carriers. There were also quite a few fragments of glass vessels (below). A coin from the time of Emperor Trajan (98–117 CE, IAA 106989) minted in Zippori was found on the floor of the cistern in a small depression directly beneath the opening. Above the layer of clay, most of the cistern was filled with large nari stones, some of them building stones and others, fieldstones. Several pottery sherds were discovered in this layer, generally along the circumference of the cistern rather than in its center, evidence that they had fallen inside after the cone of soil and stones in its center had already hardened. The upper part of the cistern was discovered filled with clean alluvium. Based on the pottery vessels and the coin, the cistern was used from the end of the first century to the third century CE. No animal bones were found in the cistern, which apparently was intentionally sealed when use ceased. The pottery vessels from the phase when Cistern D was in use (Table 1) date to the Byzantine period, primarily the fourth–fifth centuries CE, and include imported bowls (Fig. 12:1, 2), a gray jar (Fig. 12:3), a jug (Fig. 12:4) and a fragment of a kalal basin (thickness 3 cm; Fig. 12:5). A fragment of a Herodian lamp (not drawn) dating to the first century CE was found in a later layer. The pottery vessels from the phase when Cistern F was in use (Table 2) are ascribed mainly to the second–third centuries CE. Kefar Hananya pottery is the predominant component in the assemblage and includes bowls (Fig. 13:1–5), kraters (Fig. 13:6–9), a cooking pot (Fig. 13:10) and jars (Fig. 13:11–16). Shihin Ware is represented by a krater (Fig. 13:17). Several jars represent vessels that are common on Mount Carmel (Fig. 13:18). A few fragments of Yodefat jars found (not drawn) are slightly earlier than the main assemblage and date to the first century CE. The Phoenician coast is represented by a handle of a jug that is characteristic of the first–second centuries CE (not drawn). 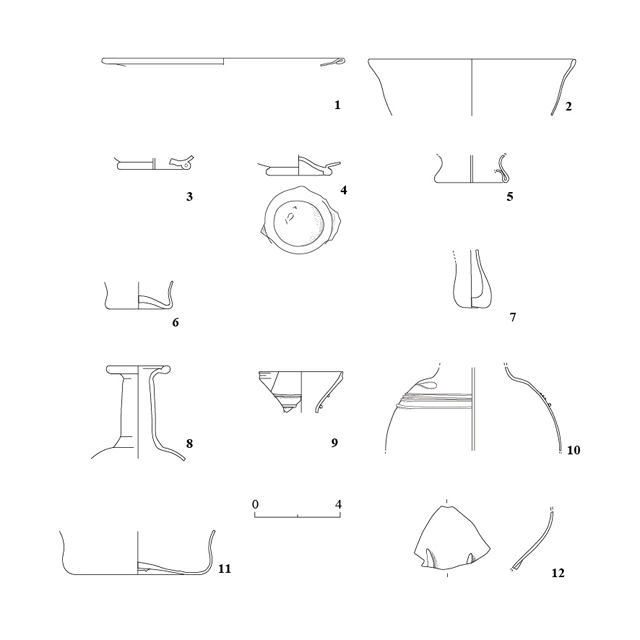 Vessels whose ascription is not as clear but are contemporary with the vessels mentioned above include basins (Fig. 13:19, 20), lids (Fig. 13:21, 22), and jugs and juglets (Fig. 13:23–25). All the jars are considerably smaller than the standard-size jars and were probably meant for drawing an amount of water that could be conveniently carried from the cistern to the house. The presence of bowls and basins in the cistern cannot be explained as easily. These may have been used for drinking and other activities near the cistern, and when they broke they were thrown into the cistern, or alternatively they could have been discarded there as refuse. A mold-made lamp decorated with a flower garland like the Southern lamps dating to the second century CE (Fig. 13:26) and many fragments of a large limestone kalal-type basin were found on the floor of the cistern. These vessels first appear at the end of the Second Temple period, but they probably continued to be used in the Galilee until at least the mid-second century CE (other fragments of a similar vessel were found in Quarry A). A fragment of a large iron key (not drawn) was found on the floor of water Cistern F.
Some fifty-five fragments of glass vessels were found. Half of the material consists of body fragments that cannot be identified. Very few of the glass finds were discovered near the quarries, but of these two folded-in rim fragments with a broad hollow fold of a candlestick-shaped bottle dating to the second–third centuries CE (L101) and a lump of raw glass (L101; greenish-blue shade, triangular cross section, max. length 6.5 cm) are noteworthy. Most of the fragments were found in the two cisterns—some in Cistern D (L106, L107) and more in Cistern F (L110; Basket 1019; Fig. 14). All the identified vessels date to the Roman period, from the late first until the early fourth centuries CE. Most of the vessels are known from other assemblages in the Galilee, mainly from funerary assemblages in Western Galilee or other areas in the region; few represent new types. The quality of the glass and its treatment seem to indicate that it was produced locally at one of the workshops operating in Lower Galilee at that time. The lump of raw glass found in the excavation suggests the presence of a local industry, though a single lump is insufficient to attest to a workshop that operated there. The artifacts recovered from Cistern D include fragments of a broad rim of a beaker or a deep bowl adorned with a thin trail beneath the rim, a large everted and rounded bottle rim, a fragment of a flat base of a bottle and a body fragment from the wall of a sack-shaped beaker (L107). The glassware dates to the third and early fourth centuries CE. A bottle with a double-folded rim was found—the rim everted and downward and then folded up and pressed (L106)—very characteristic of the Roman period throughout the empire. This type of bottle is known for example from a burial cave near Kabri dated from the first to the early second centuries CE (Stern and Gorin-Rosen 1997:4, 5, 8, Fig. 2:12). Two other bottles of a simpler type with a rounded rim were identified in the same basket. The vessels recovered from Cistern F (L110) represent a larger selection of types, described as follows: a bowl with a hollow folded-out rim made of greenish-blue glass (Fig. 14:1)—bowls such as these first appeared at the end of the first century CE and were very common in the second–fourth centuries CE. A bowl with an everted and rounded rim made of greenish-blue glass (Fig. 14:2). Bowls like Nos. 1 and 2 were found in burial caves in Western Galilee, for example at Kafr Yasif, in a cave dating to the third century CE (Gorin-Rosen, 1997b:72–73, 76, Fig. 3:2, 3 and references cited therein for Hanita). Small, low pinched ring bases (Fig. 14:3, 4). Base No. 3 may belong to Bowl No. 2. Base No. 4 is a relatively small hollow ring made of colorless glass. This base may have belonged to a glass or bottle characteristic of the Galilee in the third century CE, and sometimes even in the early fourth century CE, for example in the burial caves at Oshrat (Gorin-Rosen 1997a:74–76, Fig. 4:6—beaker, 11—bottle). A raised hollow ring base made of greenish-blue glass (Fig. 14:5) belonging to a bowl, like bowls found in tombs in the Galilee, for example at Kabri (Stern and Gorin-Rosen 1997:10–13, Figs. 6:2, 3; 7:9, 10). A base made of yellowish-green glass (Fig. 14:6) that apparently belongs to a conical beaker ends with a rounded or cut rim. These beakers were common from the end of the first to the fourth centuries CE. Many such beakers were found in tombs in the Galilee that date from the third century until the beginning of the fourth century CE, for example at Oshrat (Gorin-Rosen 1997a:63–65, Figs. 2:7, 3:7 and references cited therein for Peqiʽin, Kafr Yasif and Pella). 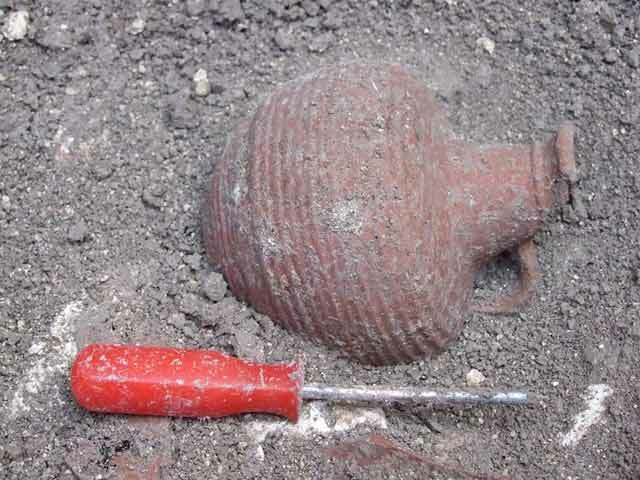 The basket also contained fragments of several bottles, such as a thickened base of an elongated piriform bottle (Fig. 14:7) of a type that first appeared in the first century and continued into the second century CE, made of greenish-blue glass. The bottle is twisted and distorted, like a bottle found in a burial cave near Kabri dated from the first century to the early second century CE (Stern and Gorin-Rosen 1997:3, 4, 8, Fig. 2:6). A bottle with an everted, folded-in rim, cylindrical neck and drooping shoulder made of greenish-blue glass (Fig. 14:8). An unusual bottle with a funnel-like, stepped rim, its end polished and thinner than the wall beneath it. On the funnel and the beginning of the neck is a thin trail protruding from the side (Fig. 14:9), the vessel and trail are made of greenish-blue glass. A fragment of a neck and body decorated similarly to the previous vessel (Fig. 14:10) was found in the same basket inside the cistern. The quality of the material and the trail that adorn the two pieces are similar and they may belong to the same vessel. A base that probably belongs to a large bottle made of greenish-blue glass (Fig. 14:11) with its bottom slightly thickened in the center and with a thin wall; it has a large pontil scar on the base. Another fragment is of a vessel with a very thin wall decorated with wide ribs that protrude both outward and toward the inside of the vessel (Fig. 14:12). Different vessels decorated with uneven ribs on the bottom part of the body are known in the Galilee, for example a bowl from a burial cave at Kafr Yasif dating to the third century CE (Gorin-Rosen 1997b:73, 76, Fig. 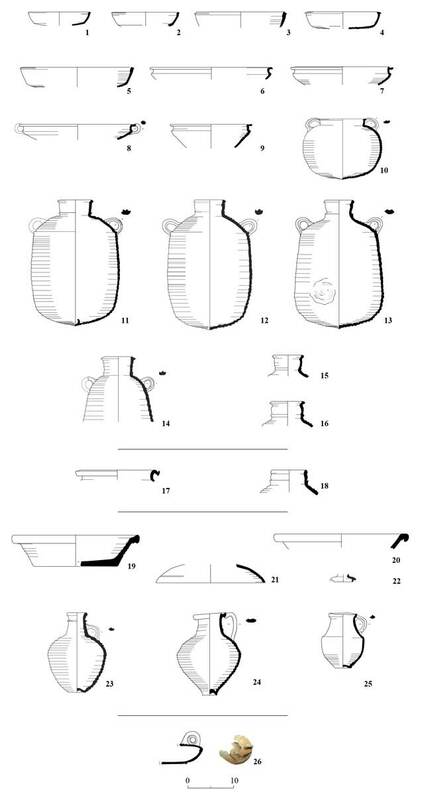 3:4 and references cited therein for bottles and beakers decorated in the same manner from a tomb in Hanita). A complete bowl with a similar decoration was found in a burial cave at Horbat ‘Eitayim near Nahariyya dated to the second–third centuries CE (Abu-ʽUqsa 2007:72–73, Fig. 6:7). The glass vessels reflect a local repertoire that could have come from a settlement complex. The multitude of finds from the last use-phase of Cistern F (second–third centuries CE; the glassware indicates a date until the early fourth century CE) and their chronological homogeneity on the one hand, and the paucity of pottery sherds from the first century CE on the other, attest to the beginning- and end-use of the cistern. The earliest remains probably survived the periodic cleaning inside the cistern. As stated, it seems that the cistern was intentionally blocked near the end of its use. 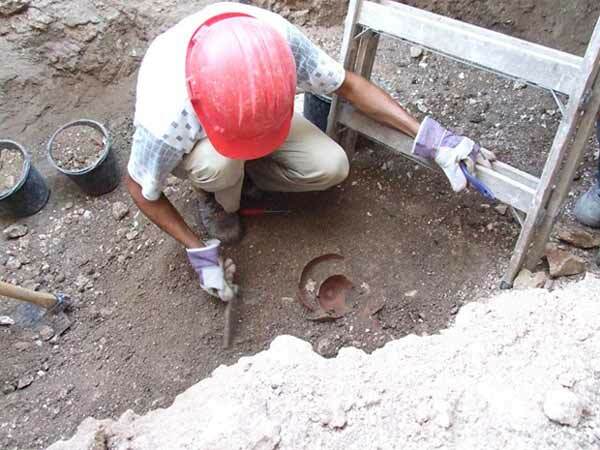 The finds in Cistern D indicate that the settlement existed in the Byzantine period as well. It can be determined with a high degree of certainty that Horbat Qoshet was inhabited by Jews during all phases of the Roman period. The clear majority of vessels in Cistern F are Kefar Hananya Ware and several are Sikhin Ware, both of which were used by Jews from the end of the Second Temple period until the fifth century CE. A fragment of a Herodian lamp and a limestone kalal, and to a lesser extent the Southern lamp, corroborate this ethnic identification. The evidence regarding the Byzantine period is not unequivocal. The fragment of the menorah relief certainly belonged to a synagogue, and based on its style, it is dated to the fifth–sixth centuries CE. Most of the synagogues are dated to the Byzantine period and the menorah indicates that Horbat Qoshet continued to be a Jewish settlement. However, some of the settlements in the area became Christian communities. This is evidenced for example by the church in Bet Lehem of Galilee. Since there is no agreement among scholars regarding the possibility of dating a synagogue according to just an artistic style, a more accurate dating of the synagogue and the ethnic identification of the settlement in the Byzantine period will have to await further excavations at the site. The installations that were examined in this excavation are located on the outskirts of the settlement, and the finds they yielded are insufficient to ascertain the size and character of the settlement throughout its years of existence. Abu ʽUqsa H. 2007. A Burial Cave at Horbat ‘Eitayim. ʽAtiqot 56 (Hebrew, pp. 65–79; English summary, pp. 76*–78*). Beck A. 2000. Qiryat Tivʽon. HA-ESI 111:20*–21*. Feig. N. 1996. A Burial Cave at Tivʽon. ʽAtiqot 30:61*–65* (Hebrew; English summary, p. 129). Foerster G. 1974. Some Unpublished Menorah Reliefs from Galilee. ʽAtiqot 7:77–80 (Hebrew). Getzov. N. 2004. Shift Planters for Fruit Trees in Quarries of the Late Roman Period in the Western Galilee. ʽAtiqot 48 (Hebrew; English summary, pp. 158–159). Gorin-Rosen Y. 1997a. Glass Vessels from Burial Caves in Asherat. ʽAtiqot 33:61–68 (Hebrew; English summary, p. 12*). Gorin-Rosen Y. 1997b. A Burial Cave at Kafr Yasif. ʽAtiqot 33:71–78 (Hebrew; English summery, p. 13*). Olami Y. and Gal Z. 2011. Map of Shefarʽam (24). (Archaeological Survey of Israel). Jerusalem. Oshri A. 1998. Bet Lehem of Galilee. ESI 18:29–30. Porat L., Frankel R. and Getzov N. 2012. The Lever Presses of Eretz Israel in the Light of the Alone Abba Oil Press. ʽAtiqot 70 (Hebrew; English summary, pp. 84*–86*). Raban A. 2012. 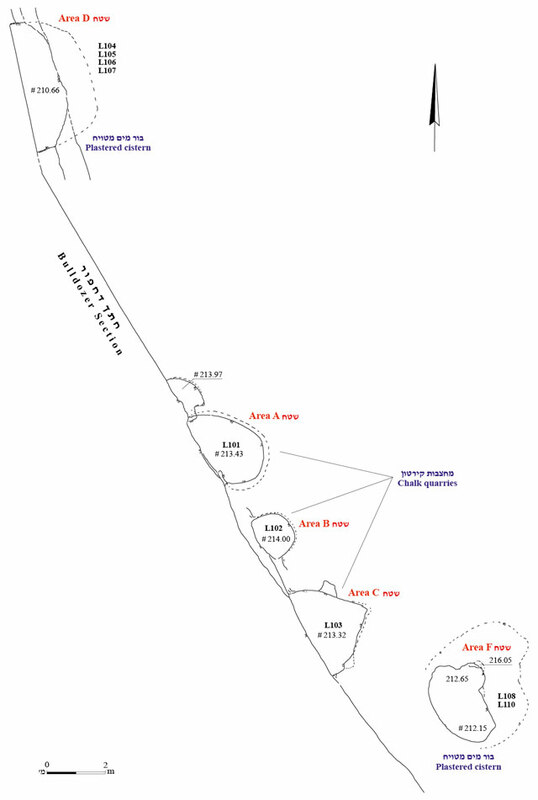 Map of Nahalal (28). (Archaeological Survey of Israel). Jerusalem. Stern E. and Gorin-Rosen Y. 1997. Burial Caves Near Kabri. ʽAtiqot 33:1–22 (Hebrew). Syon D. 2011. Suwa‘id Humeira. HA-ESI 123. 3. The areas at the beginning of the excavation, looking northeast. 4. Quarry B at the end of the excavation, looking north. 5. The stratigraphy in Cistern D before the excavation. The lower layers are hidden by the rock-fall of L105. The layer of plaster on the walls can be seen on the sides, looking northeast. 6. Cistern D during excavation. In front are small stones that blocked the cistern in the intermediate levels, looking northeast. 7. 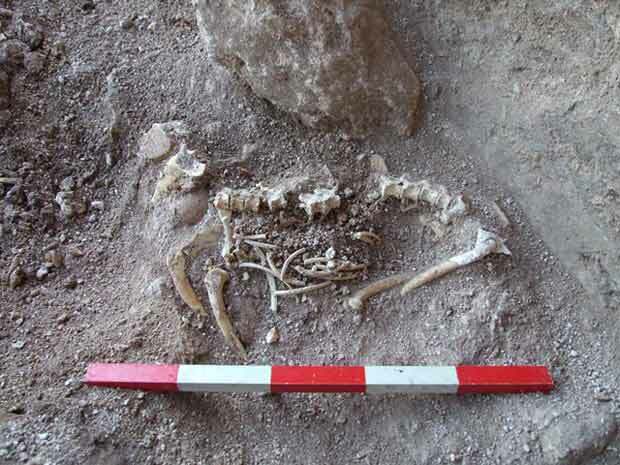 A skeleton of a small mammal next to the floor of Cistern D.
8. The layer of leveled stones in Cistern D (L105), looking east. 9. A section in Cistern F. The surface level and the layer of soil that covered the cistern are visible in the upper part of the photograph, looking east. 10. The pottery in Cistern F.
11. An intact juglet on the floor of Cistern F.
12. Pottery from Cistern D.
13. Pottery and stone vessels from Cistern F.
14. Glass artifacts from L110.